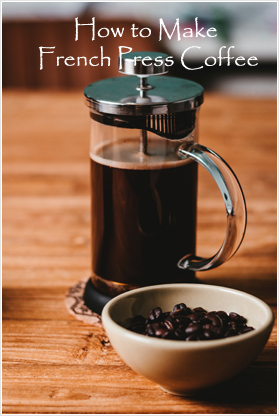 Want to learn how to use a French Press to make coffee? A French Press is perfect for making one cup of coffee, or maybe two cups of coffee, with pre-ground coffee. Below are 10 easy simple steps for making your delicious cup of coffee. Measure about 5-10 desert spoons, depending on how strong you want your coffee. Step 1: Start off by rinsing the tea kettle with warm water, for a quick clean rinse. Afterwards, add fresh purified water to the tea kettle. Step 2: Rinse the French Press, then add about 5-10 desert spoons of your favorite ground coffee to the French Press. Step 3: Boil water in your tea kettle, at about 190-210 degrees Fahrenheit (don’t measure or touch the water with your hands, it’ll burn! ), then let the water cool down just a bit. Step 4: Pour your water slowly over the ground coffee that you added earlier to the French Press. You want to make sure that the French Press is about halfway full, give or take a bit. Step 7: Slowly press down on the French Press knob (take your time. no joke.) If it takes too much pressure to press down, this means that the coffee grind is too fine. You may want to consider a coarser grind of coffee. Step 10: Enjoy your coffee! Step 11: There is no step 11... remember? The title is 10 easy steps. Just enjoy your fresh cup of coffee.